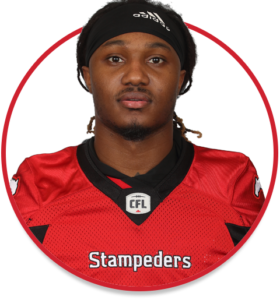 Foreman originally signed with the Stamps on Sept. 11, 2018, and was on Calgary’s practice roster for six weeks. He signed with the National Football League’s Minnesota Vikings as an undrafted free agent on Apr. 30, 2018. He was waived on May 7, 2018. (Calgary) Foreman was added to the team’s practice roster on Sept. 11 and he remained there for six weeks before being released. Foreman played 44 games and made 21 starts over four seasons (2014-17) at Texas. Over his career with the Longhorns, he made 86 catches for 1,070 yards and 11 touchdowns. He added nine carries for 75 yards and one major, 21 kickoff returns for 414 yards and 11 punt returns for 68 yards. Foreman played receiver, defensive back and special teams while earning all-district honours in each of his four seasons at Texas City High School. He made a total of 149 catches for 3,067 yards and 32 touchdowns and added 66 carries for 894 yards and nine scores. He is the twin brother of Houston Texans running back D’Onta Foreman.